During our recent RV trip we decided to stay at parks that had electric and water hook-ups as a minimum and a pool for the kids. Sure our motorhome can be self-sufficient. We can camp in more primitive parks without hook-ups, but with three little ones and a spouse who is not into the wild, power is essential. I have to agree. 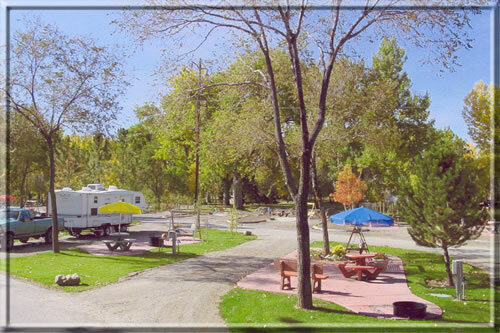 Kampgrounds of America (KOA), who by the way I have no financial interest in, run campgrounds all over North America. Almost all sites have electric and water as a minimum, many others also have sewer connections. To illustrate this I will take the KOA in Billings, Montana. Located just off Interstate 90 (I-90) at first glance it appears rather plain, but after you exit and enter the park one finds it’s in a beautifully wooded area right next to the Yellowstone River. Huge shade trees at throughout the park. Amenities include pool, hot-tub, playground for kids, restaurant serving specializing in ribs, store, and showers. After registering at the office, you are given a map directing you to the site. Some KOAs have staff who actually take you to the site and ensure you are happy before leaving you. Our site was close but not too close to neighbors, fairly level, and best of all a pull-through. What is a “pull-through” you ask? Access to your individual site is by driving in and out, with no backing up. This is a big plus when you are driving a 25 foot motorhome from which you have zero visibility out the back other than via rearview mirrors. After spotting our RV on the level pad and making sure access to the hook-ups was easily available, translation does my electrical cable and water hose reach, the family piled out. I made the electrical and water service connections in less than ten minutes. This was important because the temperature was in the upper 80’s F. Running the air conditioning was a priority. The site we had also had a cable TV connection so the kids were able to watch their favorite cartoon channels. Trust me this is essential. We had arrived at about 5:00 p.m local time. I took the kids to the playground while Cindy started part of supper on the stove. Once I got the kids looked after, I returned and barbequed some burgers on our portable propane grill. After supper our six-year old did some skateboarding (the laneways were paved), then we all went for a swim to cool off and relax. Swimming tired the kids out, so back at the RV they got into PJs and family movie night started. A DVD was selected and they watched along with mom and dad before retiring after a long day. By the way noise or party animals are not an issue at this or other parks. Quiet time after 10:00 p.m. is strictly enforced. We had planned to stay only one night, but the family so enjoyed the park we signed up for another night. Above: postcard I mailed to myself from Medora, North Dakota marking my visit. 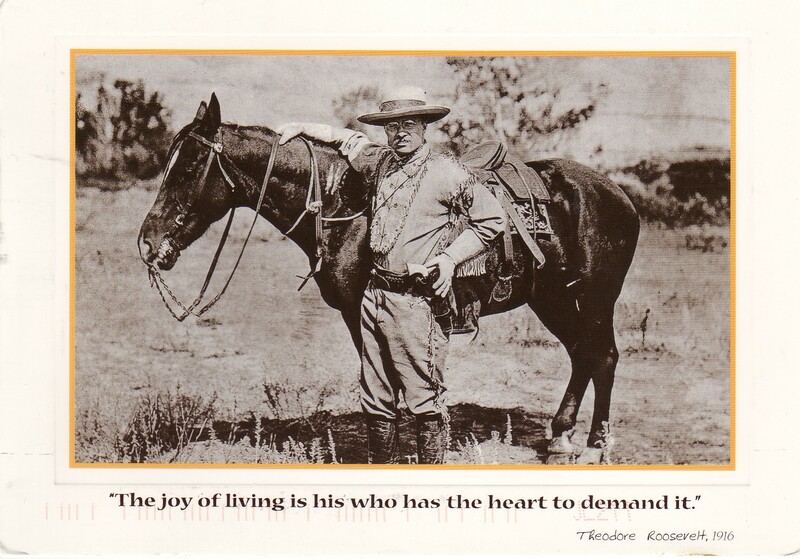 It depicts TR as he appeared during his ranch days. Theodore Roosevelt or ‘TR’ the Twenty-sixth President of the United States was shaped by his experiences in North Dakota. I’m fascinated with the man during my recent trip to North Dakota I made sure I included a visit to the Badlands of North Dakota where he spent his time learning about the western way of life. I also visited the Maltese Cross Cabin which is situated in the south unit of Theodore Roosevelt National Park at Medora, ND. Maltese Cabin as it appears today. 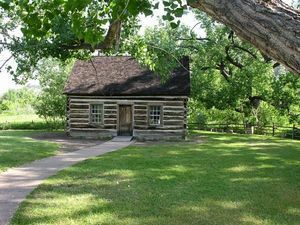 This cabin was originally located seven miles south of Medora in the wooded bottom-lands of the Little Missouri River. The cabin was built for him at his request so he could spend more time at his ranch, the Maltese Cross or Chimney Butte Ranch. TR first arrived in the Dakotas in 1883 to hunt bison. He fell in love with the land and acquired primary interests in a ranch, namely the Maltese Cross or Chimney Butte Ranch. He thrived on the outdoor lifestyle and at the ranch he actively participated in the life as a working cowboy. The men thought he was a foolish dude from the east, but he earned their respect over and over again with his hard work and upbeat attitude. On his return to the east he married Alice Hathaway. They had a child on February 12, 1884, but two days later his wife Alice died of Bright’s Disease and his mother also died of typhoid fever in the same house on the same day. He was devastated and leaving his newborn daughter in the care of his family he left for his ranch in North Dakota to attempt to heal his grief. TR enlarged his holdings by purchasing a second ranch, the Elkhorn, also near Medora. While there he wrote many books about his adventures and his ranch life. Most of all he gained an understanding of the need for conservation. Later on he always told people that without his experiences in North Dakota, he would never have become president. Roosevelt wasn’t the first president to create national parks, but he was the president who protected the most areas. He set aside over 90 national monuments and national forests as protected areas for future generations. The first one he designated was Devil’s Tower National Monument in Wyoming. I was also fortunate to be able to visit that site and I tell you it is fascinating both as a natural wonder, and also as a sacred Native American site. While standing in the Maltese Cabin I particularly focused on TR’s writing desk where he spent long hours and also his rocking chair where he held many animated conversations with visitors. It was truly history come alive. – for about $40 you get full hook-ups, electric and water, sometimes sewer. This enables one to run the rooftop air conditioner and a TV. Contrast this with a $150 hotel room. – it let us give the little ones showers in the RV without worrying about water. – took along a TV with DVD player built in. After the kids played and got jammies on, we had a family movie night complete with popcorn to end the day. – all the KOAs had children’s playgrounds and most had pools or waterslides. Great way for them to wear themselves out. – the one at Mount Rushmore even had a shuttle bus where for $4 each for the adults (kids free) we were taken to the evening lighting ceremony and got time to tour the interpretive center as well. The price also included admission to the National Monument. – the campsites at these facilities are quite level and easy to pull into for us motorhome drivers. – I was hooked up to electric and water within 10 minutes or less of parking the RV for the night. No luggage to unload. – every KOA has WiFi (wireless internet) so the laptop was well used. We ate at fastfood places a total of twice in almost two weeks. The usual for our family is once for lunch at $35 per crack and a family dinner in the evening at $80 a pop. We all ate healthier as a result. We never stayed at a hotel or motel. Our driving was only about 4 hours a day so gas was not too bad. Another big benefit was the ability to park at a shopping mall and let my wife shop, while the kids and I relaxed in the motorhome. I usually leaned back and had a brewsky while the kids drew pictures or did puzzles. More later and pictures as well. The roadtrip is going pretty well. Kids are adjusting to the motorhome travel. They have been driving their mother crazy asking for things. This involves her getting up out of her seat and waiting on them. We are now attempting to get them to help each other and get things themselves. So far we have gone from Calgary east to Williston, ND and south to Theodore Roosevelt National Park. 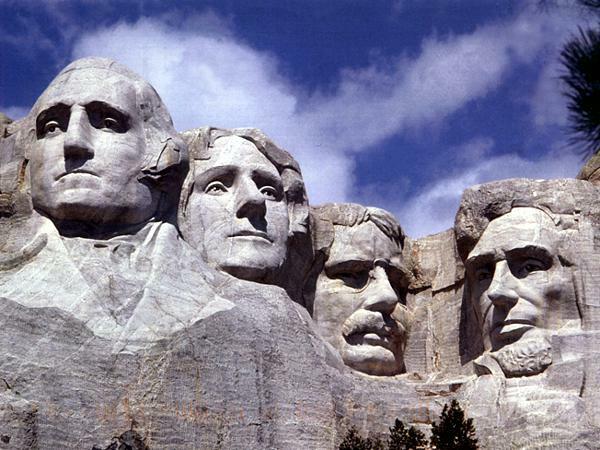 Next we spent a few days in the Rapid City, SD area seeing Mount Rushmore, Crazy Horse, and other attractions. Went east a short distance to Wall, SD and visited the tacky, but famous Wall Drug Store. This is located along Interstate 90 east of Rapid City. Also visited the South Dakota Air & Space Museum outside Ellsworth Air Force Base. This is a B1 bomber base and part of the US Nuclear Force. It was something to see a B-29 Stratofortress, a B-52, and B1 bomber close-up and personal. They had a Minuteman ICBM on display as well as a mock-up of a missile command center. Inside the museum there was the outer shell of a current nuclear weapon. Not very big, but scary powerful for its size. It was unarmed, for display of course. Now we are in Billings, Montana camping at a nice KOA and enjoying a quiet break. More ramblings when I return. 1. Don’t drive long distances in one haul. The plan is to drive only 4 – 5 hours per day. 2. Stop early in the evening. This should allow for ease of getting campsites and a more laid-back set up of the motorhome. Kids will have time for burning off energy before bed. 3. Visit attractions that appeal to all of us, especially the kids. Flintstone park and waterparks here we come. 4. Always ensure shopping malls are on the agenda along the way. This keeps my wife happy. Happy wife = happy life. 5. Stop frequently at picnic sites along the way. This lets the kids burn off steam and gets some food into them other than the “fine fare” found at the roadside choke’n’pukes like McDonalds. 6. Load the motorhome with provisions: snacks, DVD player and movies, iPods, crafts, coloring books, markers, and Tylenol (for Mom and Dad). By the way I do plan on taking my laptop along. Most of the KOA’s and other RV parks have WiFi now so I will try to post along the way. We have done several weekend camping trips with the RV, but it is still relatively new to us so I’m sure we’ll have some adventures along the way. It’s wonderful to camp in relative luxury, power, water and air conditioning. Makes the outdoors much more enjoyable. Note: For those who don’t know – the Griswold’s are the dysfunctional family who take a cross-country trip in the movie “Vacation” which was released in 1983 and became a cult favorite. It starred Chevy Chase. As a follow-up to some comments on my Canada Day posting I decided to tell you a little about my country, especially for those Americans who I hope will learn more about their ally and neighbor. The first provinces making up Canada were Canada (Upper and Lower), New Brunswick, and Nova Scotia. Upper Canada is now the province of Ontario and Lower Canada is now the province of Quebec. Yesterday as I was celebrating my country’s big day I happened to be surfing the remote. I caught a swearing in ceremony of new citizens. We who are native-born Canadians and Americans come to take living in our great countries for granted, but when you see the look of gratitude on the faces of these new citizens it makes you think. I am lucky to live in one of the greatest nations in the world. I enjoy freedom without even having to think about it. Many of these new citizens left everything they knew for a strange new country to avoid war, persecution, or other upheaval. These newcomers made me appreciate what we in Canada and the United States have and too often take for granted. So on July 1st, Canada Day, and on July 4th, Independence Day reflect on the good fortune we have to live in our countries, and celebrate with newfound insight. You are currently browsing the WRITINGS & RAMBLINGS blog archives for July, 2008.